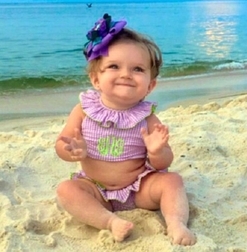 We just love seersucker and especially for making sweet monogrammable swimsuits for little girls! Here we offer a lavender gingham seersucker swimsuit. The suit is 2 piece with the top tying at the neck. The neck of the top is embellished with a sweet ruffle trimmed in lime ric rac. Monogram the top in lime to match the trim. 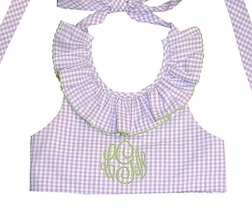 The top is paired with lavender gingham seersucker bottoms with a pretty ruffle also trimmed in lime ric rac.